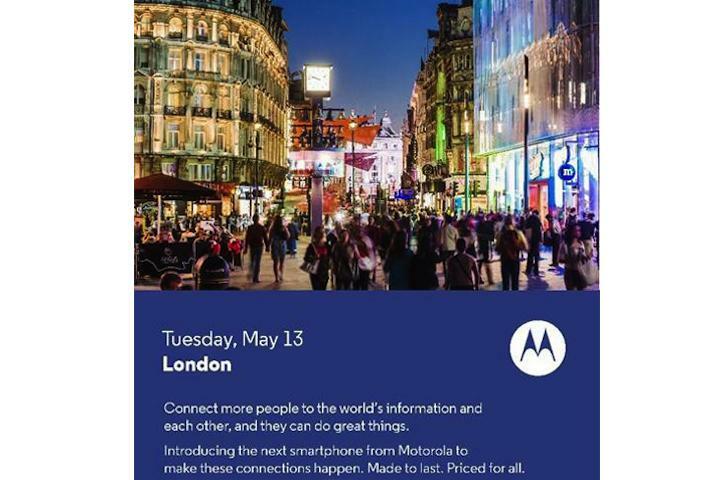 Motorola has called a press event for May 13, where it has confirmed a new smartphone will be revealed. The big unveiling will take place in London, and in addition to mentioning the new product will be a smartphone, the invitation also gives us a hint about two of the new device’s major selling points. It says the phone will be “made to last,” and “priced for all.” The latter statement could mean we’re not going to see a hugely expensive flagship phone announced, and that it may be more along the lines of the popular Moto G. Priced from $180, the Moto G is one of the best value Android smartphones available, but as it was only released in November last year, it seems a little early for a sequel to arrive. Saying it’ll be made to last suggests the phone will be resistant to damage. It’s not clear whether this means a rugged body – Motorola recently launched the Moto G Forte, which comes wearing a protective case – or waterproofing, a feature which is becoming more common in the smartphone world. Rumors have been spreading about several new Motorola phones recently. We’ve heard whispers of a 4G LTE version of the Moto G (could the “made to last” line refer to future proofing? ), and a low-end smartphone called the Moto E. We’re also expecting the follow-up to the Moto X, and there has been talk of a phablet device, referred to as the Motorola XPlay, coming before the end of the year. Would Motorola publicize and hold an event where all it announces is a low-end smartphone like the Moto E? It seems unlikely. Motorola has gained a considerable amount of market share in the UK since the Moto G’s release, and it could be looking to increase this again with a flashier model. We’ll bring you all the news on the day.